The people of the Haida Nation have occupied and collected food and materials from Kun×bar;alas since time immemorial. This heritage site/conservancy protects cultural values associated with the Cumshewa Peninsula. There are five historic villages or seasonal camps within the area: La’naiya, Kundji, Cumshewas, Koga (Qa’gal) and Kunhalas. There is also a regionally significant hiking trail along the coast, easily accessed by road at Gray Bay that connects a variety of beaches. Trails also lead to Sheldens Lagoon (Dogfish Beach – has remnants of a dam and a settler’s cabin from 1907) and Cumshewa Head which is a 24 km round trip. A popular frontcountry camping area and day-use site is located at Gray Bay, and a smaller one at Sheldens Bay. Other recreational sites of interest include the remains of an old store (1869) at McCoy Cove, the site of a Loran communications tower at Gray Point and a navigational light at Kingui Island. The terrestrial component of the heritage site/conservancy covers 3,360 hectares. The elevation range is from sea level to 417 metres. The marine component/foreshore area covers an area of 12,358 hectares. The marine foreshore area protects a variety of coastal marine values, including areas of extensive kelp beds, several small seabird colonies and northern abalone and geoduck habitat. The marine component is an area of high biodiversity, including an extensive kelp forest in Fairbains Shoal that is a unique feature along the east coast of Moresby Island. This remote campground is not regularly serviced during the winter season (December – May). Storms and high winds can occur at any time and may create dangerous conditions. Please be aware of the weather conditions when you are planning to access remote areas and be prepared for any potential emergency situation. Always provide a trip plan to someone so your whereabouts are known. 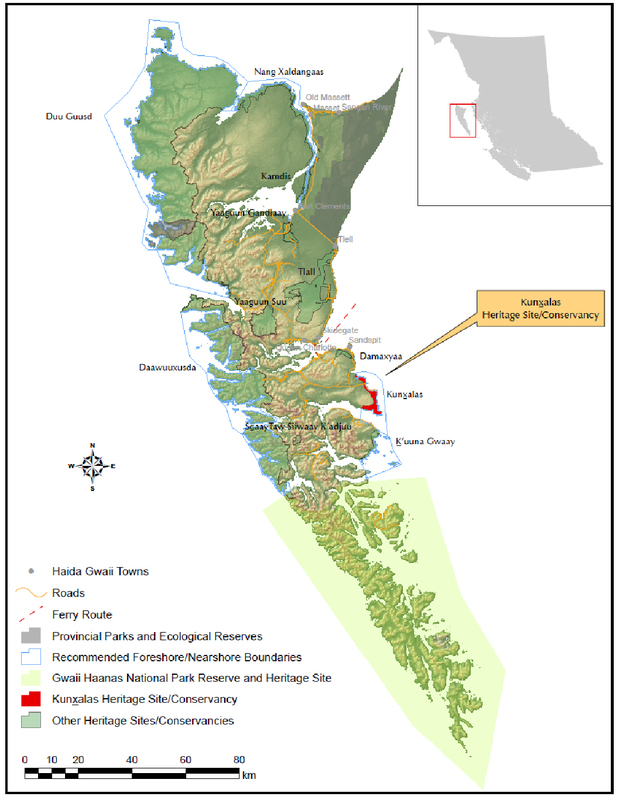 Kun×bar;alas Heritage Site/Conservancy is located along the northeast coast of North Moresby Island, about 15 km southeast of the community of Sandspit. It is part of an archipelago-wide system of protected areas that includes Gwaii Haanas National Park Reserve and Haida Heritage Site, several provincial parks and ecological reserves, and ten other heritage site/conservancies. In total, half of the land base of Haida Gwaii is now in protected status. It includes the area known as Sheldens Bay, Gray Bay, Cumshewa Head, and three small islands known as Cumshewa Island, Kingui Island, and Haans Islet. The heritage site/conservancy contains a popular campsite at Gray Bay and a coastal hiking trail that leads to Cumshewa Head. Skedans is a nearby historical trade and potlatching site where the Haida exchanged dried halibut, dried seaweed, herring roe, and canoes for eulachon grease, dried berries, mountain goat wool, and horns. It is now a reserve and the site of a Watchmen camp. Several recorded archaeological sites contain a number of cultural values. These include at least 17 known culturally modified trees, shell middens, a habitation feature, and human remains. Many of these areas have not been inventoried thoroughly which indicates that the conservancy likely contains many other unrecorded cultural heritage and archaeological sites. There are Haida names for many places throughout this area. Several rare ecological communities are found on the heritage site/conservancy. The area supports the mature Sitka spruce-crab apple/willow ecological site association which is not protected elsewhere on Haida Gwaii. Fens and marshes, swamp wetlands with Western red cedar, skunk cabbage and Sitka spruce and cedar/shorepine bog-forest complexes border waterways and lake margins. Forested areas are mainly Coastal Western hemlock/Western red cedar and Western hemlock/Sitka spruce site associations. This area has transitional lowland – plateau topography which results in high habitat diversity. Rock drumlins are found in the shale faces on Cumshewa peninsula. The rocky steepland is characterized by talus, rocky outcrops, cliffs, gullies and runnels. The northern half of this area is dominated by marine sedimentary rocks and the southern portion of the area is dominated by intrusive rocks. The marine component is an area of high biodiversity, including an extensive kelp forest in Fairbains Shoal that is a unique feature along the east coast of Moresby Island. Sea Lion haulouts exist on the north and south section of Cumshewa Inlet and Cumshewa Rocks, off the mouth of the inlet. 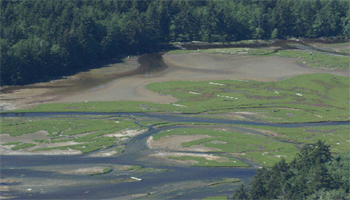 The heritage site/conservancy contains northern abalone and geoduck habitat. Kunxalas Heritage Site/Conservancy contains fish-bearing streams that are known to host coho salmon, Dolly Varden, rainbow trout, cutthroat trout, and Coastrange sculpin. The area hosts numerous listed species including Marbled Murrelets (red listed). Pigeon guillemot breeding pairs frequent the nearshore and Northern goshawks (red listed) may inhabit the area’s 2,350 ha of old growth forest (>250 years old!). The management plan for Kun×bar;alas Heritage Site/Conservancy was approved in 2011 by both BC Parks and the Haida Nation.